The secret of the ‘spring’ that powers the mantis shrimp’s lightning fast strike has been revealed by scientists in Singapore. They discovered that the layered arrangement of tough bioceramics and stretchy polymers lets the shrimp store up massive amounts of energy in its front limbs without shattering them. The team hope that their work on the shrimp spring’s structure could inspire the development of new elastic materials. 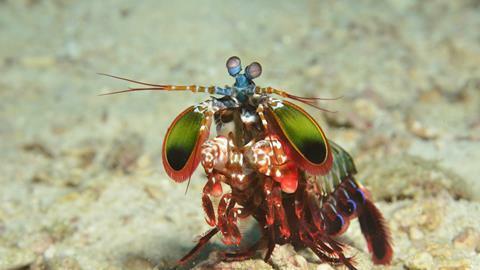 Mantis shrimps are the fastest punchers in the animal kingdom, capable of moving their club-like front limbs at 50mph to smash apart the shells of molluscs and other crustaceans. Their punch is so potent that they are often a menace to keep in captivity because they can break aquarium glass. 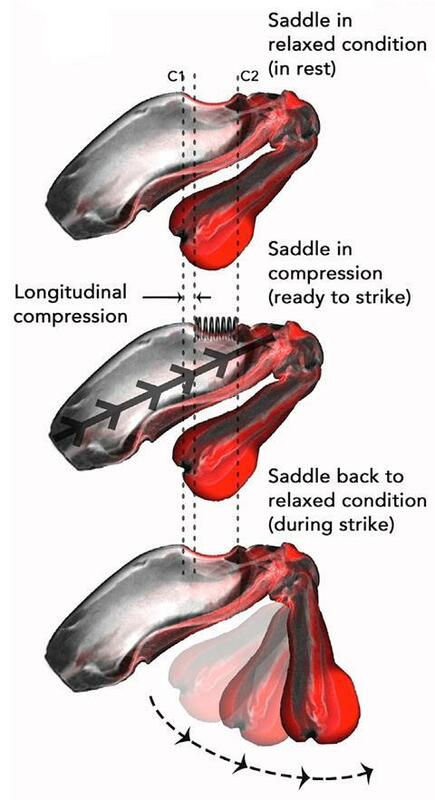 Previous research has shown this extremely fast movement is made possible by a spring-like elastic storage mechanism in their limbs – a structure called the saddle because of its distinctive shape. ‘When muscles pull on the saddle it is loaded elastically like a bow and arrow system. When the energy stored in the saddle is released, the energy is transmitted to the club that then strikes its prey,’ explains Ali Miserez from Nanyang Technological University in Singapore. MicroCT image of the combined saddle and club of the shrimp, illustrating the three loading stages of a strike: resting position (top), compressed position right before striking (middle), and relaxed state again (bottom) after strike. His team wanted to explore how the material composition of the saddle allowed it to function under extreme forces without being damaged. They took samples from mantis shrimps and used techniques such as nanoindentation – where a diamond tip is used to measure depression of a surface – to determine the mechanical properties of its constituent materials on the microscale. They also used lasers to cut thin cross sections of the saddle and subjected these to mechanical testing, as well as building computer simulations to determine how forces act on different regions. They showed that the saddle is made of two distinct layers, one on top of the other. The top layer consists of amorphous calcium carbonate, a hard but brittle bioceramic, while the bottom is made of stretchier biopolymers such as chitin, the material that makes up the shells of crustaceans and cell walls of fungi. It is this arrangement that allows the saddle to bend without breaking, Miserez explains.